Revo Pixis review | What Hi-Fi? The Revo Pixis is the little brother to Revo’s Axis XS. While the larger unit sports FM, DAB/DAB+ and internet tuners, plus support for network streaming and Last.fm, the Pixis keeps things simple with FM and DAB/DAB+ tuners only. The Pixis’s design DNA is clear to see, with it retaining the large, clear display and tactile control wheel of the XS, but doing away with the adjacent speaker, instead having it firing out of the top. The interface is painless to use, but we did find the touchscreen a tad inaccurate with our finger-jabs. On the plus side, though, it’s easy to access the stations you want – we particularly like the retro FM dial and the ability to drag your finger along the screen to tune in to your broadcasts. Revo Pixis: Sound qualityWith the lovely tones of BBC Radio 2, though, the Pixis offers a pleasing sound, with some qualifications, however. It certainly has beef, and that bass weight belies the unit’s size, but with it comes a touch of fizz to higher frequencies and a hollowed-out quality to the midrange. But with a bit of EQ tweaking, the overall the sound is likeable. And that’s why the Pixis gets four stars to the Axis XS’s full five. We aren’t taking into account the feature list here – you’d expect the bigger unit to have more to it – but it’s definitely worth a listen. 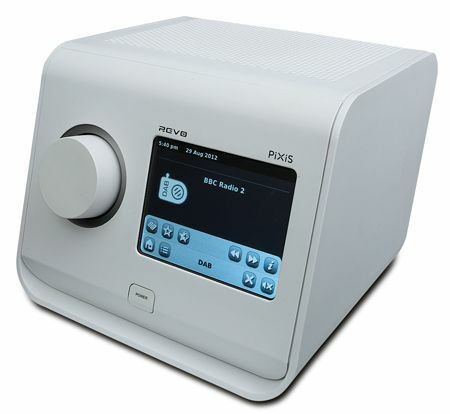 As a step up on the bedroom radio, though, the Pixis is pretty good value.